Scottsdale: Poisoned Pen Press, 1999. 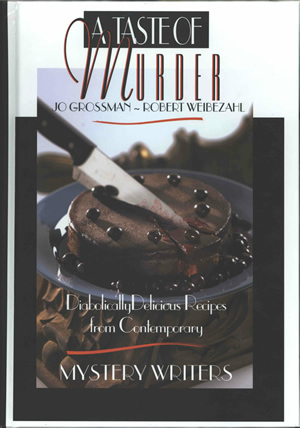 A Taste of Murder: Diabolically Delicious Recipes from Contemporary Mystery Writers is by Jo Grossman and Robert Weibezahl and contains a recipe for "Salami à la Chama River" by Tony Hillerman on page 58. This edition was published by Poisoned Pen Press in Scottsdale, Arizona, in 1999. The cover design is by J.J. Smith-Moore and the overall color scheme is black, white, and red. The front cover features a photograph of a large knife cutting into a single layer cake. Above the photograph on a white background and partially overlapping the top edge of the photo are printed the book title and authors' names in decorative fonts. The subtitle is printed below the photograph. The back cover has a red background overlaid with a white rectangle in which the text is printed in black. At the top of the white text area, reverse-printed in white on a black text area is "FINALIST FOR THE AGATHA AND MACAVITY AWARDS." The back cover text otherwise contains a description and praise quotes for the book. The bar code, book price, and publisher imprint appear at the bottom of the back cover. Binding: Full-color glossy coated boards. The spine is black, with the book title printed on it in white, and the authors' surnames in red.